Thomas Hinerman was born on Nov. 27, 1815 (or 1819) in Millsboro, Washington County, PA. It's possible that he was the son of George and Mary (McConnell) Hinerman Jr., with George born in 1796 in Maryland -- or of Jesse and Sarah (Shutterly) Hinerman, with Jesse born in Millsboro, Washington County, PA. He is not to be confused with "Thomas Hinerman" (1834-1919), also of Greene County and the son of farmers Samuel and Hannah (Acklin) Hinerman. At times the family name was spelled "Hineman." While a native of Pennsylvania, some thought Thomas had come from Germany. This suggests that he spoke German and that a mixture of English and German would have been spoken in the household. Thomas married Elizabeth Bush (1819-1891) in about 1839, when he would have been age 23 and she 20. Elizabeth was a native of Millsboro. While her maiden name has been provided by several sources, another one -- the obituary of her eldest son -- gives it as "Shape." Their nine known children were William Hinerman, Joseph Hinerman, Henry Hinerman, Jackson Hinerman, Thomas A. Hinerman, Nelson Hinerman, Albert Hinerman, Elizabeth "Lizzie" Knapp and Eliza Jane "Jennie" Yates. Upon her marriage, Elizabeth came to Aleppo to set up a life with her husband. The Waynesburg Republican reported that they "purchased a farm all uncleared and she worked out of doors, doing a man's work, for several years. She was a very industrious woman all her life but these early years of overwork ruined her health and she became old and feeble before her time." Said the Waynesburg Democrat, Elizabeth "was a very industrious woman and one of the early settlers there." The family appears together on the federal census enumeration of 1870. At the time, they lived on the family farm at Aleppo. The Hinermans were members of the Church of God at Windy Gap. Aleppo Township map, 1860, showing Hinerman farms circled in red, with Thomas' at far right, north of the Windy Gap Church. Courtesy Library of Congress. Sadly, Thomas's father Samuel died in 1872. In the last will and testament, the father wrote: "Item. I will and bequeath to my son Thomas Hinerman that part of my farm on which Inow live commending at the southwest corner on the West Virginia line thence by said line to harts run thence up said Run to the corner of Andrew Hinerman's farm thence a south course to south line thence west by land of Jacob Isiminge [sic] to the place of beginning, Reserving to Jesse Hinerman all the fruit of what fruit threes [sic] Jesse planted on the said tract containing fifty four Acres more or less." In 1880, the census shows Thomas and Elizabeth in Aleppo, next door to their married sons J.T. and Thomas A. Hinerman and their families of children. They continued to ply their lifelong skills as farmers. At upper left of this map are the farms of "A." and "T." Hinerman -- 100 acres and 97 acres, respectively, located south of Aleppo and east of New Freeport, in Springhill Township, from the 1875 Atlas of Greene County. Note the nearby Church of God, where Elizabeth's funeral was held in 1891. Sadly, after more than a half century of marriage, Elizabeth died at the age of 72 near Aleppo on Nov. 14, 1891. She had endured "a very long and painful illness," said the Democrat. "Owing to feeble health, for several years, she did not go away from home often. After 52 years of married life her husband is left to spend his last days companionless." The Republican noted that "Her last sickness was long and attended with great suffering. She was very lovingly cared for by her children and died surrounded by all the comforts of a good home.... She died the death of a christian, looking gladly to a better world." Elizabeth's funeral service was held in the Windy Gap Church of God, with Rev. Anderson preaching the sermon. She was laid to rest in the church cemetery, with a "large crowd of people assembled to pay a last tribute of respect to the aged mother who had lived so long in their midst," said the Democrat. "Uncle Tommy" Hinerman who is our oldest citizen, is still able to make his almost daily trips to the post office that he may get the latest addition to his bible, the "Commercial Gazette." He is in his eighty-third year, and reads well without the aid of glasses. His political opinion is, that Quay is the best man in the United States and that he does all things as a clear conscience dictates. Enduring a never-ending case of dropsy, Thomas died at the age of 84 years on May 21, 1900. An obituary in the Democrat called him "one of the oldest citizens of Aleppo township [who] was an industrious, honest man. In politics he was a Republican of the strictest type." He was interred in the Windy Gap Cemetery. Thomas had dicated and signed a last will and testatment on Oct. 23, 1899, "being of sound mind, memory and understanding." He bequeathed to son Albert his farm of 110 acres along Wheeling Creek, bounded by the farms of the Evans, Simmons and Ullom families. He also charged Albert with providing "reasonable care" to son William Hinerman, living at home at the time, and to "furnish a decent burial ... and to erect tombstones at our graves." Son Thomas was to receive $300, son Jackson $200, and daughters Lizzie Knapp and Jennie Yates $100 each. In addition to William's maintenance on the home farm, he was to receive a token payment of $5. Son William Hinerman (1840- ? ) was born in 1840 in Greene County. He never married but was a well known farmer, "a member of the Windy Gap Church of God and was a highly respected citizen," said the Waynesburg Republican. At the death of their father in 1900, the father bequeathed the home farm to Williams' brother Albert, but charged him with providing William with "reasonable care" and to "furnish a decent burial ... and to erect tombstones at our graves." He also received a payout of $5 from the estate. 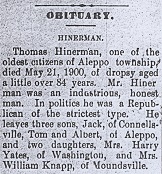 Circa 1918, when mentioned in the Waynesburg Republican obituary of his brother Albert, William lived on the old Hinerman homestead in Aleppo Township. In the late winter of 1922, William contracted a fatal case of influenza. he died at home on March 19, 1922, at the age of 82. He was laid to rest in the Windy Gap Cemetery, with funeral services led by Rev. Moyer. Interestingly, given the strong anti-German sentiment in the United States during and after World War I, and as many of the Hinermans conveniently shortened the name and dropped the "r" at the time to sound less German, William's name in the Republican obituary was spelled "Hineman." Son Henry Hinerman (1844- ? ) -- a.k.a. "Hineman" -- was born in about 1844 in Greene County. As a young man of 16, in 1860, he lived on his parents' farm in Aleppo Township and provided farm labor. Thomas served in the Civil War as a member of the 18th Pennsylvania Cavalry, Company A. He enlisted on Sept. 4, 1862 when he was 18 years of age. His company was commanded by two captains -- William C. Lindsey, who survived the Battle of Gettysburg only to be cut down a few days later in a charge at Hagerstown, MD -- followed by Guy Bryan, Jr., who survived the war Among the other privates in the 18th Pennsylvania Cavalry were John Finnegan, John McKean and Henry C. Ullom, each of whom is profiled on this website. Early in his military tenure, Henry and the 18th Cavalry were stationed in the vicinity of the District of Columbia, defending the city against possible enemy invasion. During Gen. Robert E. Lee's invasion of Pennsylvania, the 18th Cavalry saw action at Hanover (June 30, 1863) and Gettysburg (July 2, 1863). The Gettysburg fight took place at the very southern tip of the battlefield near Big Round Top. The 18th was part of what scholars have called a "suicidal attack" led by Gen. Elon Farnsworth. Under heavy fire, the 18th retreated, and Henry was spared injury. Henry's name today is memorialized on the Pennsylvania Monument at Gettysburg. Henry Hinerman's name on the Pennsylvania Monument at Gettysburg. Below, the monument to the 18th Pennsylvania Cavalry on the battlefield. Sadly, Henry did not endure the war, and died of disease on a date not known. In 1909, Henry was named on several pages of a book about his Civil War regiment, History of the Eighteenth Regiment of Cavalry, Pennsylvania Volunteers, authored by by Theophilus Francis Rodenbough and Thomas J. Grier. Son Jackson "Jack" Hinerman (1847-1920) was born on March 12, 1847 in Greene County. His middle name may have been "Thomas." In about 1872, when he was age 25, he married 19-year-old Clara Stewart (March 6, 1853-1923), daughter of John Stewart. The couple produced seven children -- Mary E. Hinerman, Walter S. Hinerman, Thomas J. Hinerman, Franklin Pierce Hinerman, Oscar F. Hinerman, Cleveland Garard "Jack" Hinerman and Lawrence O. Hinerman. Federal census records for 1880 show the family in Aleppo Township, with Jackson earning a living as a day laborer. Circa 1900, he is known to have lived in Connellsville and Uniontown, Fayette County, PA. That year, he worked as a "gauger" for the government. At the death of his father in 1900, Jackson was named in the last will and testament and was bequeathed $200 cash. In 1918, when mentioned in the Waynesburg Republican obituary of his brother Albert, he made his home in Uniontown. At the age of 73 and retired in the spring of 1920, Jackson was consumed over some unknown malady. Putting a gun to his head in the afternoon of April 15, 1920, he pulled the trigger and was instantly killed. Burial was in Oak Grove Cemetery in Uniontown. Son Laurence O. Hinerman was the informant for the official Pennsylvania death certificate. Clara survived her husband by three years. Her address was 4 Craig Street in Uniontown. Interment was in Oak Grove Cemetery. Suffering from endocarditis at the age of 70, on Oct. 16, 1923, she passed away. Daughter Mary E. Hinerman (1871- ? ) was born in about 1871 in Aleppo. Son Walter S. Hinerman (1874- ? ) was born in about 1874 in Aleppo. Son Thomas J. "Tom" Hinerman (1876- ? ) was born in about 1876 in Aleppo. Son Franklin Pierce Hinerman (1878- ? ) was born in about 1878 in Aleppo. Son Oscar F. Hinerman (1880- ? ) was born in October 1880. He an oil driller. He lived and worked in Uniontown, until about 1954, when he moved to Tulsa, Oklahoma. Son Cleveland Garard "Jack" Hinerman (Nov. 1883-1956) was born in 1883 and grew up in Uniontown. He moved to Amarillo, TX and "helped the area's oil development grow," reported the Amarillo Globe-Times. He "came west from Uniontown, Pa., and at the height of the boom here, he and his brother, Tom, drilled many early wells in the field for major oil companies. In 1929, Jack Hinerman formed a partnership with the Herrmann Brothers and continued drilling operations. He established a reputation for being one of the most careful contractors in the field. He also was a part owner of the Gunn-Hinerman Tire Company, now known as Gunn Brothers." Tragically, in December 1956, while driving in Amarillo, Jack was killed when the vehicle he was driving was struck by a moving railroad train. Son Lawrence O. (or "Laurence") Hinerman (1891-1964) was born in Feb. 1891. he was a printer in the Uniontown area for the Fayette Publishing Company. He was married twice. His first wife, Bessie Echard, died at age 32 on July 13, 1919. After three years as a widower, he wed again in July 1922 to Nellie C. LaClair. His address in 1923 was 71 Dawson Avenue in Uniontown. He died in Tulsa on Feb. 6, 1964. Son Nelson Hinerman (1850-1883) was born on Aug. 30, 1850 in Greene County. His birth year also has been given as 1853. He was a farmer who never married. At age 25, in 1880, Nelson lived at home and worked with his father on their farm in Aleppo Township. A local newspaper, the Waynesburg Republican, once said "He was much beloved, by all who knew him...."
In the late autumn of 1893, he was stricken with a severe case of gastritis. Despite receiving care from the best local physicians, he could not rally. He died on Nov. 17, 1893, at age 30. Said the Republican, "He leaves a father, brothers and sisters to mourn his loss." He was laid to rest in Windy Gap Cemetery. 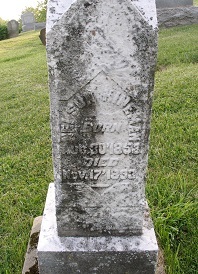 His grave marker was legible when photographed in 2007. That the "Lord careth for the Soul." Son Albert Hinerman (1858-1918) was born on Sept. 30, 1856 (or 1858) in Aleppo, Greene County. He remained single for many years as he focused on a life of business entrepreneurship. It's possible he was the same "Al Hinerman" who took in a motherless niece Maud Alice Hinerman in the late 1870s, but questionable since he was just beginning his work career at the time. At the death of his father in 1900, Albert was named in the last will and testament and was bequeathed the home farm of 110 acres along Wheeling Creek in Aleppo Township, bounded by the farms of the Evans, Simmons and Ullom families. He also was to administer the estate and to provide reasonable care for his unmarried older brother William and to give the father and brother a decent burial and to erect markers at their graves. In 1905, when he was age 46, Albert married Mary Hannah Hall ( ? - ? ) of Benwood, Marshall County, WV. They had two children, Albert Edward Hinerman and Anna Catharine Hinerman. Sadly, daughter Anna died in her third year of age, on May 25, 1914, due to a combination of bronchial pneumonia and whooping cough. ...devoted his entire time ... to farming. He was a progressive farmer and took an active part in grange work and was a familiar figure among young and old at the various sales, etc., where the interests of the community were to be promoted. During the Red Cross Drives he conducted most of the sales, and his activity contributed largely to the success of these efforts. In politics he was a staunch Republican and took an active interest in the political affairs of his county. He died after a stroke of paralysis on Nov. 23, 1918, at home. In an obituary, the Republican noted that "He had been ill but two weeks, and during his entire life had enjoyed unusually good health." Rev. Hamilton officiated at the funeral, followed by interment in Windy Gap Cemetery. Daughter Elizabeth "Lizzie" Hinerman (1859-1906?) was born in 1859 in Greene County. She married William Knapp (1858- ? ). They first lived in Greene County and by 1900 had migrated to Moundsville, Marshall County, WV. They had two known children -- Rayma Knapp and Oma Knapp. William was a house carpenter, working in and around Moundsville. At the death of her father in 1900, Lizzie was named in the last will and testament and was bequeathed $100 cash. In addition, the will stated that in the event Lizzie died before her father, her daughters were to receive an equal share of $50 each. Elizabeth is thought to have died on Sept. 27, 1906, in Moundsville, of meningitis of the brain. This needs to be confirmed. Daughter Rayma Knapp was born in November 1882 in or near Greene County. Daughter Oma Knapp was born on June 12, 1885. She is believed to have married Grover C. Archer (1887- ? ) of West Finley, Washington County. Their nuptials took place at the Moundsville residence of Rev. W.D. Reed of the Methodist Episcopal Church on Aug. 20, 1908. Daughter Eliza Jane Hinerman (1863-1940) was born on April 8, 1863 in Aleppo, Greene County. She married Harry Yates ( ? - ? ). They were members of the Aleppo Church of God. The couple had one son, Thomas Yates. The Yateses lived in Washington, Washington County, PA in 1900. By 1918, when named in her brother Albert's newspaper obituary, she was in Cameron, Marshall County, WV. Her home in Cameron was on Maple Avenue. Suffering from chronic heart disease, Eliza Jane passed away in Cameron just nine days after her 77th birthday, on April 17, 1940. Her remains were placed into rest in the Cameron Cemetery. Her granddaughter Edna Daugherty of Cameron was the informant on her official West Virginia death certificate. Son Thomas Yates was married and had two children, Walter Yates and Edna Daugherty. He resided in Lancaster, Fairfield County, OH, and was mentioned by name in the Waynesburg Democrat obituary of his mother in 1940.